Not many people get the chance to travel all over the world. Even fewer people get to travel across the globe in pursuit of their passions. Colter Harper is one of those few. The current guitarist of the rock/world band Rusted Root has studied music from places most could only dream of visiting, learning foreign instruments such as the one-stringed violin, and participating in funeral rites. Harper has used that experience to fuse together unique styles for his band as well as his own solo project. His determination enabled him to achieve a PhD. in music while touring, but his achievements don't just cover the realm of music, as Harper is an accomplished photographer as well. Harper has performed in Erie as both on his own as well as with Rusted Root, where he has helped adapt the band's hit song "Send Me on My Way" to fit his own personal stylings. He will be bringing his solo performance again to Erie at PACA on Wednesday, June 19. Tom Shannon: The last time we talked you said you were on the road, right? Colter Harper: I'm on the road right now with Rusted Root. We are in Wilmington, N.C.
TS: Are you guys on tour, or are you just playing an out-of-town show? CH: We're doing about eight or nine dates, something like that. We're out for about a week and a half, so we'll be back just before I play in Erie. TS: What inspired you to become a musician? CH: Well, I don't know if anything specifically inspired me to become a musician. I was always very interested in music for as long as I can remember. I was always studying some instrument or another. I don't know if I ever really wanted to be a musician as a profession because it's a pretty hard life, but somehow I ended up doing that. Yeah, I don't know – it's just something that's always called me, for as long as I can remember. TS: How did you get involved with Rusted Root? CH: They were looking for some new members, and a mutual friend of ours had recommended me, because I had spent some time studying music in West Africa and they were looking for someone who had more of a world experience with guitar and percussion, which kind of fit in with what they were doing. TS: Have you played in Erie before, either in Rusted Root or as your own solo act? CH: Sure, many times. I've played Docksider's and the crooked i, and with Rusted Root we played, what's it called, 8 Great Tuesdays? Down on the water? TS: Yeah that's it – 8 Great Tuesdays. CH: Yeah we've played that and some other festivals as well. Erie is kind of right in our backyard, being from Pittsburgh. TS: Yeah a lot of other bands from Pittsburgh come up and play Erie a lot. Like Punchline, they're from Pittsburgh and they just played up in Erie about a week ago. They said they always get a really good response from people in Erie. TS: So you said you studied music in Africa, and I read on your website that you've traveled all over the world studying music. Where else have you gone, and have you taken any musical inspiration from the music of the places you visited? CH: Oh, of course. I don't know if I'd say I've studied all over the world. I mean, I've lived in West Africa and I've traveled through Europe and Morocco, and I've spent some time in Brazil, Northern Brazil. So, you know, I travel to places where I want to study the music. It's what kind of motivates me to travel, and I do love traveling. So when I go to places like that, I try to learn as much about the music of those places as I can, and all that stuff works its way into my music. TS: Since you've been to all these places, have you seen anything you found shocking in other cultures, or have you been given any crazy, off-the-wall opportunities? CH: Oh yeah, definitely. In West Africa, a lot of the music I was studying was music that was performed in funerals. And so many times I would go to funerals and participate in these funerals, which took many days, you know, maybe three or four days. And being part of that whole event was very powerful, seeing how music was performed as a way to celebrate the lives of people who had just recently died, and in some cases performing and being part of that whole community was very interesting. TS: Did you have to learn to play any kind of new instrument for these funerals? CH: Sure, yeah I studied many instruments. The West African xylophone, a one-stringed violin, which is called a Gongey, lots of different percussion. So I've studied many different instruments, but guitar is my main instrument. TS: I read on your website that you're also really into photography. Have you ever found ways to combine your interests of music and photography? CH: Well, I guess when I travel I like to learn music, but I also like to photograph it. So I like to create images that capture that dynamic of how music is used in people's lives. It's always been an interest of mine. I enjoy being a photographer and a visual artist as well. TS: What are some themes or messages you try to get across with the music that you write? CH: I guess that there are many kinds of music in the world. And as someone who's always traveling I'm always trying to hear things in a new way. So I'm hoping that other people are interested in that as well, and that we can hear music in many different kinds of ways, and that reflects a lot different perspectives. It's interesting because what we call music is usually a very specific thing. Like if you call something music or if the next person calls something music, it usually means something very specific to them, but there's many ways to think about what music is, like how it's supposed to sound, or how it functions in our lives. TS: Do you find it challenging to be a solo artist while also being in a band? CH: Well, yes and no. Being in Rusted Root allows you to connect with a lot of new musicians and also develop ideas with the band, which you may take and work on your own. It's good in that sense of course; it does take a lot of time and effort to put into their music as well. So it's always balancing it out. TS: I read online that you were also able to complete a Ph.D. in music while on the road. How were you able to manage that? CH: I was doing course work, and then when we started touring heavily, I was what's called ABD, which is All But Dissertation, so it was just up to me to do the research and write a 300-page dissertation. So on the road, I did a lot of transcription and reading and preparation. And when we weren't traveling, I would just go to the library and basically work until I was completed with my dissertation, and I could defend it. TS: The last thing I want to talk about is, when Rusted Roots most successful or at least most commercially successful song "Send Me on My Way" was released in 1994. I was only 3 years old, but I recognized the song from being in one of my favorite childhood movies, Matilda. So I didn't realize it was Rusted Root who wrote it until recently, because I was just a toddler when it received its most airplay. And you said you just joined the band a few years ago. CH: Yeah, I joined in 2007. TS: So you weren't in the band when they wrote the song. How do you think you and Rusted Root have evolved with that song, since you're now part of the band and that's such a significant part of what they've done? CH: Well, that song is what most people identify with the band, and it's almost like a ritual because we play it every performance, and it's something everyone expects and really enjoys. So every time we play it, even though we're playing it in the same way, it's sort of a new experience because it's like the ritual part of the night, because it means so much to people. But in terms of the song itself, we've rearranged it a little bit since Preach Freedom and myself have joined the band and brought our own interpretation to it to keep it evolving. But yeah, it's one of those songs that's resonated well with a lot of people, so you don't want to change it too much, because it means so much to people. 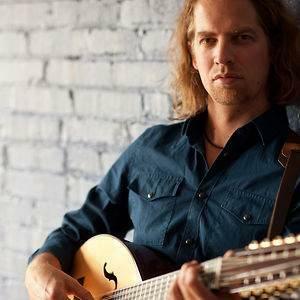 The Colter Harper Band releases their new CD Wednesday, June 19 at PACA, located at 1505 State St. Check Facebook for ticket prices and further details. Tommy Shannon can be contacted at tShannon@ErieReader.com, and you can follow him on Twitter @txkx.